Yesterday, the Nobel Laureate disclosed that contrary to insinuations, he graduated with a Second Class Upper and not Third Class as widely believed. 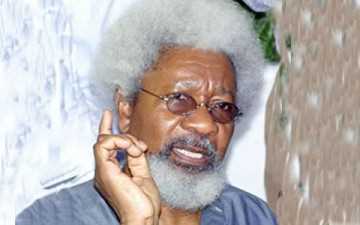 Soyinka broke his silence when he hosted secondary school students from across the country who were in Abeokuta, Ogun State to take part in this year’s “Open Doors Series” project, an international cultural exchange programme to mark his 79th birthday. According to Soyinka, he had kept silent on the matter over the years, but decided to open up for the sake of the children as mark of respect for them. The event, tagged: “Memoirs of our future,” was organized by a Lagos-based multimedia company, Zmirage and the state government. I feel really bad when people excuse their inadequacies with such examples, now tell me what happens now?? Since our failure-turn-hero story is gone does that mean you cannot be successful again? NO. However, This new discovery just teaches that there is no excuse for failure, no rule says if you are succeeding today you won’t fail tomorrow, also no rule says “ceteris Paribus, those who have failure issues of today are the Soyinkas of tomorrow”. The Main rule of success which I believe Nigerian youths need is work, work and work again. My grandpa would say “awori mo ni iwe” in other words learning is a function of consistent effort, no one is a genius and no one is a dullard.